January 04, 2013, 3:22 pm -- /EPR NETWORK/ -- OhioHealth recently took an important step toward strengthening its palliative care and hospice programs with the appointment of two nationally prominent physicians to its leadership team. 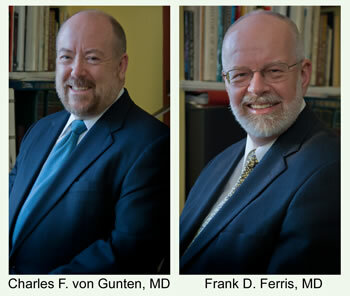 Charles F. von Gunten, MD, PhD, and Frank D. Ferris, MD, assumed their leadership roles December 3 in response to the increasing demand for end-of-life care in central Ohio. von Gunten will serve OhioHealth as Vice President, Medical Affairs for Hospice and PalliativeMedicine, while Dr. Ferris will assume the post of Executive Director, Palliative Medicine Research and Education. The physicians arrived from the Institute of Palliative Medicine at San Diego Hospice, where each was internationally known for work and research in the field of palliative medicine. Their hiring represents a major commitment on the part of OhioHealth to palliative medicine, a type of specialized care that focuses on symptom relief and quality of life for people with serious illnesses. "This is an exciting time for us, as Dr. von Gunten and Dr. Ferris will work to create a palliative medicine program that will set the standard for the integration of palliative care across an entire health system," explained Bruce Vanderhoff, MD, Chief Medical Officer, OhioHealth. "Studies have shown that palliative care combined with standard care prolongs life and improves quality of life better than standard care alone. Our goal is to make palliative care available through every appropriate clinician and service line at OhioHealth." von Gunten will oversee the medical directors for HomeReach Hospice and Home Health, and Kobacker House inpatient hospice. "I came to OhioHealth to be part of an exciting vision that will strengthen all of the health programs here because the pain, suffering and stress experienced by patients with serious illness are going to be addressed from physical, social, spiritual, emotional and family perspectives. Everyone needs some palliative care skills, it is not something only specialists do," von Gunten said. Ferris will head the creation of a comprehensive education program for physician and staff members to ensure the long-term sustainability of the program. "Education is a key component of a comprehensive system-wide model," Ferris said. "Our goal is to empower as many associates as possible to become effective teachers for others. Eventually we will have palliative care services available through every clinician and specialty service in the system." The physicians are known for pioneering new approaches in pain and symptom management, and improving education and practice standards in palliative medicine. von Gunten developed a model for palliative care that is the basis for most of the nation's hospital-based programs. He played a leading role in gaining formal recognition of palliative medicine as a medical sub-specialty. He also is editor-in-chief of the Journal of Palliative Medicine that will make OhioHealth its new home. He recently was honored by the American Cancer Society as "Palliative Care Pioneer." Ferris is a celebrated clinician and educator who helped integrate palliative medicine into healthcare systems throughout Canada, the United States and the world. He also played a key role in the development of a widely used end-of-life care curricula in oncology education. Each has substantial research experience and has been widely published in the medical literature. "As OhioHealth develops its commitment to palliative care over the next few years, other health systems are going to be interested in what we are doing here," von Gunten said. "The influence of OhioHealth could be large, not only throughout the United States, but around the world." Added Ferris: "The extent of what is being proposed here - to incorporate palliative medicine across an entire healthcare system - is really extraordinary. OhioHealth can be a leader in this community, and the community can be a leader in America."